In 1989, I was a high school student in a small county in Northeastern China. Two years later, I was admitted into Peking University. If I had been born two years earlier, I could have been the one overrun by tanks and my mother could have been one of the mothers who have shed all her tears but have been forbidden to speak the truth or to simply commemorate. Those who died on June 4th died for me, and died for each one of us the survivors. In other words, their death lives on in our life. Without realizing this, we will not be able to understand ourselves and the China we are living in today. Therefore we are obliged to remember that massacre, we are obliged to demand truth and justice, and we are obliged to carry the torches of those who have succumbed too soon. This is why I am standing here tonight. For the first time, I have come to Victoria Park on the night of June 4th. Before I came, I was warned by the security police and my employer China University of Political Science and Law: You shall not participate in any Tiananmen movement commemoration events. But I must come, and I must tell friends in Hong Kong how much we thank you for keeping the memory of the Tian’anmen movement alive. I must tell the whole world: Twenty-five years have passed, but the massacre did not stop at 1989. The killing, in the name of a political “campaign,” in the name of law, in the name of stability maintenance, in the name of state unification, has never stopped. The tank man Wang Weilin evaporated from the earth; more “Wang Weilins” have been put to death. From the execution of the so-called June 4th “hoodlums,” to petitioners and prisoners who died in prisons and in all manner of black jails, from Tibetans who braved snow-capped mountains to flee to Uighur women who protested peacefully; from Falungong practitioners to citizens rejecting forced demolitions; from street vendors to pregnant women rejecting forced abortions; from Sun Zhigang, Li Hong, Li Wangyang to Xia Junfeng, Cao Shunli and Goshul Lobsang. The list goes on. For 25 years, resistance against suppression has never stopped either. The citizens’ rights defense movement has developed in China despite ruthless crackdowns. Rights lawyers, citizen journalists, independent writers, and street activists, more and more people have stood up to fight, just as many of you tonight come from mainland China for the vigil and will go back afterward. I salute you! For my efforts to promote the human rights movement in China, I have been in turn suspended from teaching, disbarred, placed under house arrest, kidnapped, disappeared, and detained over the last ten years. During my detention, secret police tortured me and humiliated me out of anger and frustration. But I do not regret what I have done, and I do not back down from it. Because there is no place to back down. Hong Kong has no place to back down either. Without democracy in mainland China, Hong Kongers will not have true universal suffrage, and its press freedom, freedom of association and demonstration and other freedoms will also be taken away eventually, inch by inch. We must Occupy Central with Love and Peace! 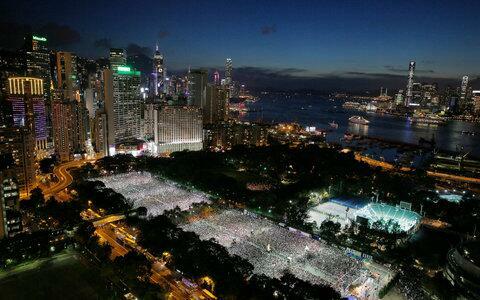 We also look forward to occupying Tian’anmen Square with love and peace one day. Just as we did in 1989! That year two things happened – the peaceful democracy movement of ‘89 and the bloody massacre of June 4th. Let’s have another 89, but not another June 4th! That day will come, because we have been, and will be, fighting for it! Watch Teng Biao’s speech here. Chinese original. Translation based on an edited version from Dr. Teng Biao. By China Change in Analyses and Opinions, Political Transition on June 5, 2014 . “Occupy Central with Love and Peace!” eventually became “Mainlanders Get Out!” That’s what you get with a band of unprincipled rag-tag paupers trying to espouse an idea they are incapable of understanding. Let me remind you thus, 25 years afterwards from 1989, PLA soldiers walk the streets of Hong Kong without fearing for their lives, and the hoodlums from the Liason Office bark out orders and threats with no sign of remorse. It is blades, bullets, bombs, and shells that speak, NEVER words. It is a Leviathan that the people of Hong Kong are trying to deal with. And without proper weapons and tactics, defeat and death should not be surprising, even having others accompany you into the grave. And I despise you since you even hope that the Leviathan actually listened. The Leviathan NEVER listens. The ONLY way to deal with the Leviathan is to SLAY it. And worse still, now that these paupers found out that they are unable to best the Leviathan, their rage turned to their neighbor just across the border. You have forgotten how your ancestors arrived in Hong Kong in the first place, fleeing an Illiad of woes thanks to the Chinese Stalinists. You refuse to others the rights you yourselves do enjoy when you go against the shoppers from Shenzhen. Already you are mass-denying the right of asylum, and now you are denying access to safe food and water. You are a people of ingratitude and unprecedented hypocrisy. There is NO love and peace as long as the Leviathan lives. And Tian’anmen Square cannot be reclaimed through peaceful means. We lament our deaths in 1989, as we were the prophets unarmed. We have paid a high price for lessons of Realpolitik. The only way out for those of us still remain, the rest of us trapped in China, and the people of Hong Kong is the way building up to war and revolution. Put a bullet through the head of the PLA soldier next to you. Obtain the addresses of CCP officials and safehouses present in Hong Kong and arrange for each of them a silent death. Life is to short to waste away in futile gestures such as hunger strikes, which are only meant for losers. Get some exercise and train up for the deaths to come.